Arcopoli is a member organisation of IGLYO and an LGBTQ association aimed at equality and social inclusion. It is based in Madrid, Spain. Though Arcopoli was created in a University environment and originally reflected students’ perspectives, its original focus and targets of work increasingly expanded in the last years. To know more about Arcopoli’s work, we interviewed Arcopoli’s Coordinator Yago Blando. 1) Yago, what is your role inside Arcopoli? I am the coordinator (the CEO) of Arcopoli. I’m in charge of the well functioning of the association and also of our strategy. Inside Arcópoli, I work in the legal department (thus I’m not a lawyer… I’m an engineer!). I also work inside the Hate Crime group, which is a group of fifteen volunteers who help victims of hate crime. 2) What is a very exciting project Arcopoli is currently working on? Currently, we have three projects that I’m pretty excited about: first is that we have written an Law Against Discrimination Towards LGTB People and we think it may pass (will applies only in Madrid) and we are recollecting ideas to make it better – thus it is very good. 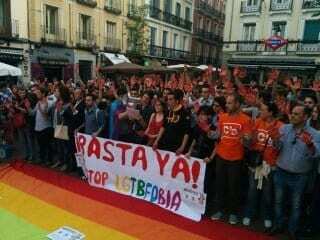 The second project is that we are setting up an LGTB web among all the towns in Madrid, big or small. Almost everything that is not Madrid capital has no organisation or anything related to protect LGTB people, so we are setting up a support web in a lot of towns. We want to make all towns connected to Madrid, but that may take a while. The last one is the Hate Crime group we have created. We assist victims whenever they call us, we comfort them and we offer to accompany them along all the process of denouncing the aggression. We are also creating a lot of materials on the subject. 3) What is a priority in Arcopoli’s agenda? Hate Crimes, for sure. We believe that, after marriage equality, the fight against hate crimes is the next milestone in the LGTB activism. 4) Why did Arcopoli want to become a member of IGLYO? We are very interested in enforcing relations with other organisations all around the globe, and IGLYO is a perfect opportunity for this. We are an association that was originally established in the University -nowadays we work in and out the University- so we are very interested in working with young people. 5) Which is the most useful advice you would like to give to an LGBTQI young person at present time? You are not alone. There is a lot of people fighting for your equality, you matter to them and they will never stop fighting for you and for any LGTB person in the world. There is power in the union, and together we can achieve it. Would you like to know more about Arcopoli’s work? Finally take a look to this recent campaign Arcopoli launched to fight LGBT-phobia in high schools! The picture represents the demonstrations against Hate Crimes Arcopoli organised last may. Interview taken in October 2015.